Here's some different facts about the city in the desert - Las Vegas. From desert to the world's most famous gambling city! 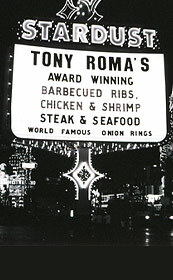 The city of Las Vegas has a relatively short history. From the beginning here was just desert and a place to stay, on their way to Gold country. It was in 1911 Las Vegas became a "city" but not until the 1930´s, it became legal to run casinos and gamble again since this had been banned a long time. Las Vegas is also a great entertainment city, and has been visited by most major stars over the years, such as Elvis Presley, Frank Sinatra, Judy Garland and Marlene Dietrich, and many many more. When to go to Las Vegas? 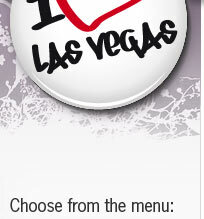 You can visit Las Vegas any time you like. It is a little bit up to yourself what you like - very hot or less warmly. We have visited the city, both in April and once in July. We thought April were really comfortable and July was very very hot. We have nothing against the heat, but to those of you who may not want to have 35-40 degrees celsius probably should not go to Vegas in the summertime. The street where all the hotels and casinos are located! 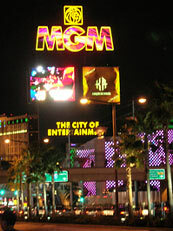 All the famous hotels and casinos is located on what is known as The Strip. It is an appr. 7 km long part of the street that goes right through from south to north. 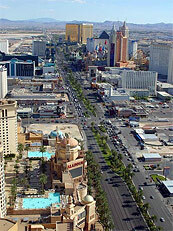 The street is a actually named - Las Vegas Boulevard South, but has become more known as the Las Vegas Strip or in short, the Strip. Home for some of the world's largest hotels.